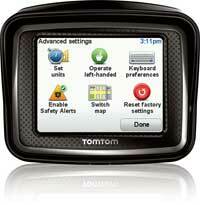 With so little in weight, the TomTom Rider comes with a waterproof exterior and features Bluetooth capability that makes for convenient hands-free phone calls and data-exchange. With the BlueTooth connection capability, you can also have directions delivered to your helmet or headset. It does come with a USB 2.0 to help connect to a computer, and has internal memory although it doesn’t come with an SD card slot. The 4.3-Inch screen is not only glove-friendly but is one of the multi-touch variety. The waterproof screen also provides for high visibility in the sunlight. The unit comes loaded with free ‘Lifetime’ maps for the UK, Ireland and 45 European countries, with an option of updating them throughout the year. 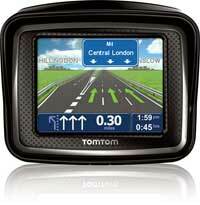 The free lifetime updates help ensure that you have the latest routes present on your sat nav. A fitting kit is available that works on a number of bikes. There is a Winding Roads feature that enables you select the route with the most curves in case an adrenaline rush is what you seek! Much as the Rider can be directly wired into the bike’s battery, this is a very long process that requires routing the wiring and so on. Since a fitting kit is provided, in case you do change bikes often, then you can multiple positioning points. The kit however isn’t quite as complete as some of its rivals though, it misses on a few connectors that enlarge fitment options. Putting that aside however, it does come with enough to fit the Rider at least someplace usable, if not entirely aligned. You can touch the sat nav’s screen with any kind of glove, inclusive of the thickest and it will still work. You may however notice that a winter glove may just require a lot more prodding than its light counterparts, but the ultimately, the job is done. A number of options are available on the menu to make for a pleasant ride to your destination. You can input an address via a full or partial address or you can input it by post code. With the PC Route Management via Tire feature, you are in position to search and create routes on your computer and then proceed to upload the same onto your sat nav. 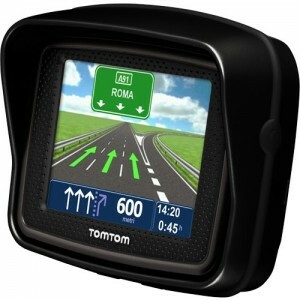 At the end of the day, the TomTom Rider is an amazing sat-nav unit for a motorcyclist, and it works tremendously well , making it an ideal choice to look into in terms of the numerous satellite navigation units on the market. Unfortunately, there are drawbacks to owning this gadget some of which include; coming with no mount which means that you have to purchase it separately in case you need it. In addition, there is no car charger attached to this unit, which again means that you have to purchase one separately. I wish the new sat nav had the protruding screen shade, its a cool feature!